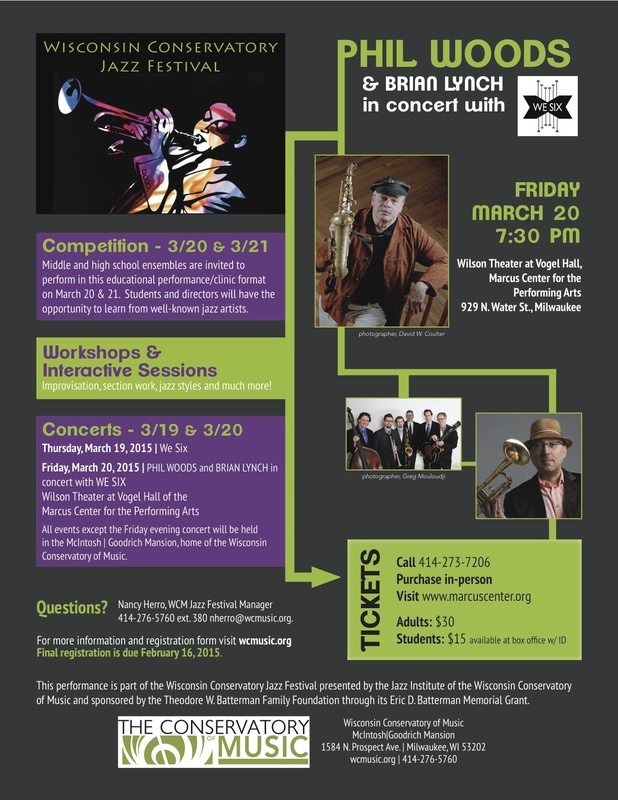 The Festival that surrounds the Competition will include the Thursday evening performance of WE SIX at the McIntosh|Goodrich Mansion; the Friday evening performance by Grammy Award winners PHIL WOODS and BRIAN LYNCH in performance with WE SIX in the Wilson Theater at Vogel Hall of the Marcus Center for the Performing Arts; as well as breakout sessions on improvisation, section work, jazz styles and much more! Competition will take place on Friday, March 20th, 10:30 a.m. – 5:30 p.m. and Saturday, March 21st, 8:30 a.m. – 6:15 p.m. Each ensemble will have a maximum of 45 minutes on stage to set-up, perform, work with the clinician, break down and exit the stage. Ensembles of ten or more will be considered a band, and ensembles of less than ten will be considered a combo. Band Directors will create their own jazz oriented programs of three compositions, using genres such as traditional, swing, big band, bebop, straight ahead, Latin or fusion jazz. At least 2 of the 3 selections must offer contrasting styles, as well as tempo and dynamic variations. Performances will be heard by a panel of judges and a clinician. Immediately following each performance, the clinician will conduct a clinic to provide immediate feedback on the ensemble’s performance. Each participating school will be given up to 10 tickets for the Friday, March 20 performance as a bonus for their competition participation. Additional tickets for participants may be purchased at $10 each.